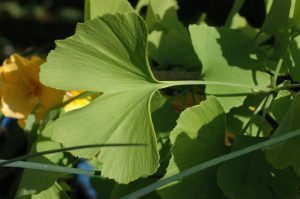 You are here: Home > Blog > Flora & Fauna > Unusual or exotic trees -the maidenhair tree, Ginkgo biloba. The maidenhair tree is otherwise known as Ginkgo biloba, or just Gingko is native to China, but is widely cultivated through the world. The name Ginkgo may be derived from a misspelling of the Japanese Gin kyo or silver apricot - referring to the form of its fruit. The biloba part of the name refers the two lobed form of the tree’s leaves. Ginkgo is a dioecious species, that is to say, there are separate male and female trees. The female tree produces quite large seeds within a yellow brown soft fruit-like structure. Though attractive in appearance, it has a a rancid smell. The smell is due to butyric acid in the fleshy part of the fruit; and for this reason it is male trees that are usually cultivated. The male trees produce small cone-like reproductive structures, not dis-similar to those seen on other gymnosperms. It is an unusual tree and is sometimes referred to as a “living fossil’. Recognisable forms of Gingko date back to the Permian period - some 270 million years ago. It is a gymnosperm and produces 'naked seeds' - the 'nakedness' of the seeds refers to the seeds being born on scales arranged in cones. Angiosperm seeds are formed within a totally enclosed structure. 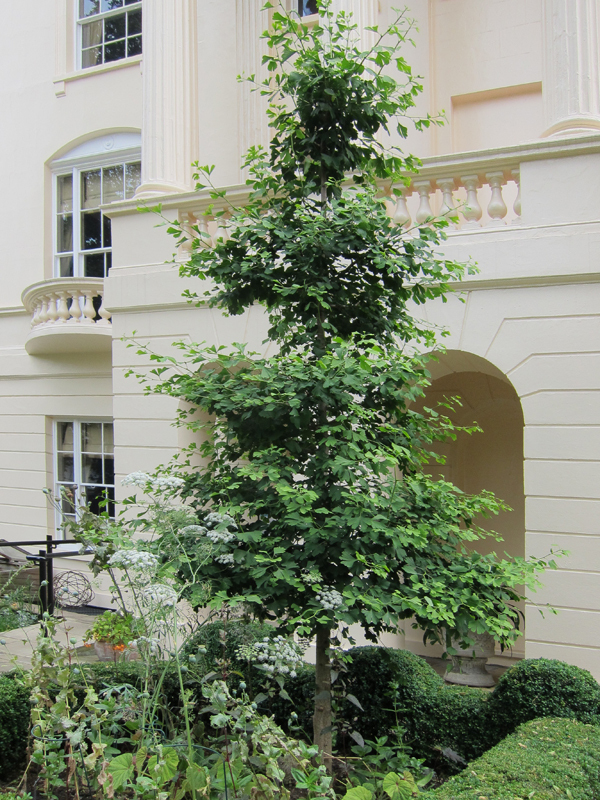 The tree grows well in well watered and well drained places , it is relatively shade intolerant. It can grow to a height of some 20 - 35 metres and is often deeply rooted. When young, the tree is tall and slender with few branches; though the crown fills out with age. During autumn, the leaves change to a distinct yellow colour and then fall (again unusual in a gymnosperm - though larch does this). The leaves are unique in form. They are fan shaped (jpg adjacent), but notched or divided - hence two lobes (biloba) The veins radiate out into the leaf blade from the leaf stalk - but do not form a network. Two veins enter the leaf at its base and these split into two again and again. This is known as dichotomous venation (see image). The leaves can be between two and four inches long, and have a long, slender petiole (leaf stalk). 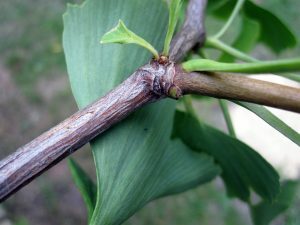 Ginkgo trees may be quite long lived as they show a surprising resistance to disease and the wood is resistant to insect attack.The trees can show vegetative growth as they can sprout from buds near the base of the trunk - particular in response to soil erosion. Similar structures are seen in modern trees and shrubs, such as Eucalyptus that are subject to fire. Many wild trees are multi-stemmed. The larger branches of older trees can produce roots (in response to damage of the crown). If these make contact with the soil, then a ‘new’ but clonal plant can be produced. In China, the trees are to be found along stream banks and rocky slopes, i.e. in somewhat disturbed habitats. This ‘fits in’ with the sites where fossil forms of Ginkgo have been found - the sediments / rocks again indicate they were formed or laid down under disturbed conditions like those associated with streams / levees. It is perhaps surprising then that Ginkgo trees adapt well to the urban environment and tolerate pollution. Indeed, an excellent specimen can be seen growing in the front garden of the South London Botanical Institute - next to the South Circular Road through S.E. London! The trees are attacked by few insects and are relatively disease free. 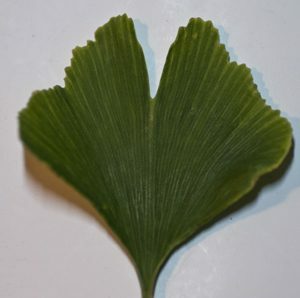 [Extracts of Ginkgoo have been used for medicinal purposes since ancient times. There is detailed information of its therapeutic uses here]. Do you know anywhere in Edinburgh we can find this tree? I think the preferred name (and the correct scientific name) is ginkgo, not gingko. The smell of the fruit is indeed disgusting; that didn’t stop local Chinese residents, where I used to live in New York, from gathering up windfalls from the pavement outside our apartment.